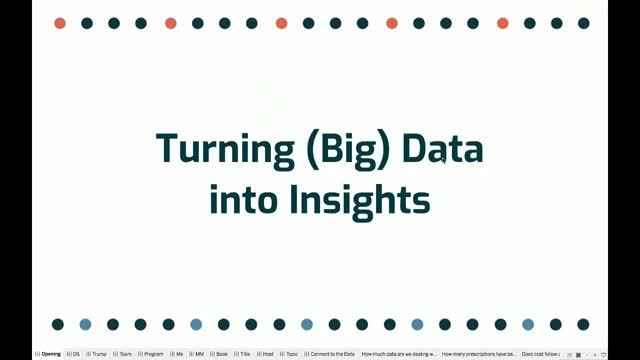 Join Andy Kriebel as he provides you with a step-by-step approach to analyzing big data. Andy will interrogate 724 million UK prescriptions in Exasol to identify insights and show you how to focus the analysis to tell a compelling story. Sign up and get answers to your questions during this webinar and learn how you can use publicly hosted data sets for your own analyses. The cloud will inevitably be a component of your customers’ and prospects’ strategies, not to mention your own. But how does this impact analytics? That question is especially important since the journey to the cloud has many stops, and most companies won’t move all their data to the cloud immediately. It’s a heterogeneous, hybrid world out there: some data must stay on-premises, while some data is born in the cloud and should stay there. Other data allows discretion around migration and can be left in place. But when it comes to analytics, the work should encompass all data. Yet, how is that achieved with a single platform, when data isn’t centralized? The International Air Transport Association (IATA) is the trade assocationof the world's airlines, representing around 290 airlines, accounting for 82% of the total air traffic. In this webinar you will learn, how Cargo iQ – an IATA interest group -allows their members to optimize overall airfreight processes with a highspeed benchmark dashboard using Exasol and Information Builders. The benchmark reporting allows airlines to compare to other members and assesses all services provided by the participating companies along the transport routes being used using a standardized and agreed process. Solution Partner iRIX implemented an online portal that provides self-service milestones analytics of individual routes, timeframes and services. Mathias Golombek, CTO at Exasol, looks to next year to predict the technology trends that will impact businesses in 2019. Over the years we’ve tracked the changing use of data within business. Every year, data becomes more important, and closer to the heart of successful businesses. We’ve also seen a maturity in how we view data – businesses no longer talk about big data, it’s just data now as they all intelligently look at how it can be used to drive growth or reduce costs. Following the data collection and transformation processes described in the previous webinar, phase 2 of our project was to visualize the data around the global Twitter discussions surrounding the UN General Assembly. Kevin Lynch from the Information Lab Ireland developed a comprehensive dashboard to bring the data to life and highlight the demographics of users as well as the topics discussed by them during and after the event. Join us for a walkthrough of the process, the connections to the data, the analysis and visualization approach and a demo of the dashboard. Kevin Lynch will present his work in Tableau and will be joined by Gayan Peiris, Digital Strategist at the UN SDG Action Campaign, who will share how the outputs are being used by his team and beyond. A small team of data experts collaborated to collect, analyze and visualize Twitter data from the UN General Assembly. In this webinar we will take you through the data collection, preparation, transformation and loading process and show a live demo of the Alteryx workflow that was used. Join us, ask questions during the webinar and see how you could easily build a data pipeline to collect information about a specific event or initiative. This webinar is targeted at any level of expertise, we will explain concepts, processes and individual steps taken with the different tools. Learn how WhereScape allows you build, change and operate your data warehouse via a drag-and-drop GUI, then auto-generates the corresponding code and deploys it with ELT. This removes human error and the need for hand coding, enabling you to benefit from Exasol’s rapid in-memory analytics faster, with less resource. Retail has reached a point where multiple forces are driving irreversible changes in the industry, with outstanding or negative impacts. However, retailers that have embraced digital innovation are thriving. The future of commerce is now a new era where experiences are omni-channels and where digital is omnipresent. As Retail is becoming more and more omni-channel, you are able to gather tons of data, but in most respects, it’s deeply uninformative. Analytics might help you to contextualize this data, but how do you make sure that you gather insights fast enough to stay ahead of the pack? Big Retail and e-commerce names are relying on Javelin know-how and Exasol’s database to get near real-time analytics, and transform data into actionable inputs. Piedmont is a not-for-profit healthcare provider consisting of 8 hospitals and 1674 beds based around the Atlanta Metro area. In 2016 alone they served over 2 million patients, with plans to increase its footprint further in 2018 with the addition of 3 more hospitals to the network. The business intelligence and data architecture teams are comprised of 24 people, who are responsible for compiling and disseminating the healthcare provider’s enormous amount of raw and highly sensitive data to its planning and analysis groups, and relevant hospital decision makers. Organisations have woken up to the realisation that they need to become data-driven. Simultaneously, IT is under pressure to create a single consolidated view of all the available data. Eventim sells hundreds of millions of tickets through multiple online platforms. The question it asked itself was how best to consolidate and leverage this data? We developed the world’s fastest database for analytics and data warehousing, and offer first-class know-how and expertise in data insights and analytics. We offer more than a product, we offer a partnership. Through empowerment and expertise, we transform how the people run their business and help people see and understand their data.